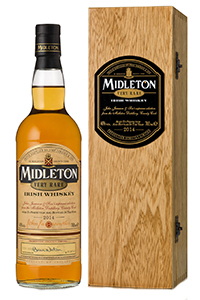 July 15, 2014 – For the first time since Irish Distillers introduced the Midleton Very Rare range in 1984, there’s a very noticeable change on the label. After 30 annual releases signed by Master Distiller Barry Crockett, the 2014 edition is signed by his successor, Brian Nation. Crockett retired last year, and the main stillhouse at Midleton Distillery was named in his honor last September. Brian Nation’s first Midleton Very Rare doesn’t stray from the tradition Crockett established, using a combination of Single Pot Still and grain whiskeys distilled at Midleton and matured for up to 22 years in lightly charred ex-Bourbon casks. In a news release, Nation described the pressure of living up to his mentor’s legacy. The 2014 Midleton Very Rare release will be available at whisky specialist retailers in Ireland and select European markets, along with the US. Pricing information has not been announced.